Canadian Automotive Parts Manufacturers' Association President Flavio Volpe delivered a 30-minute speech in Shanghai. The Canadian auto industry’s aggressive pursuit of Chinese investment continued at the Shanghai auto show April 20 with a keynote address before a high-profile audience. 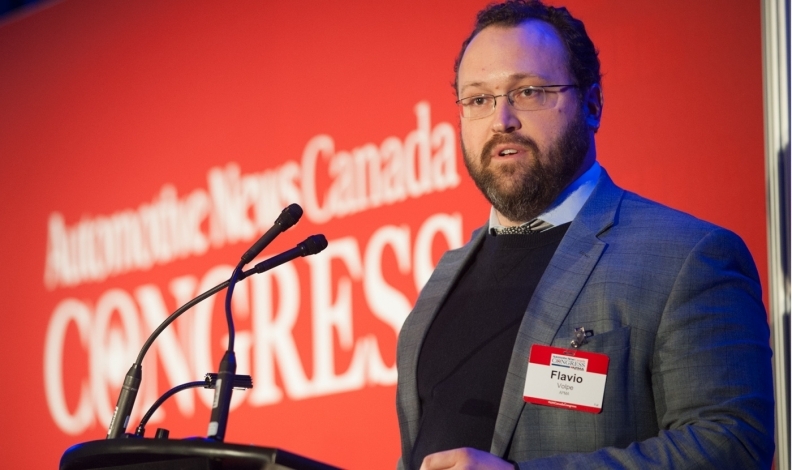 Canadian Automotive Parts Manufacturers’ Association President Flavio Volpe delivered a 30-minute speech touting Canada’s auto sector and what it offers. Volpe delivered his address on the main stage of the International Auto Key Tech Forum, which is part of the show. He also secured meetings with three of China’s biggest automakers, though he declined to name them. “Frankly, I think it’s an unprecedented opportunity to feature Canadian auto innovation to leaders of the world’s biggest auto play at the world’s largest show,” he said. The Shanghai show covers nearly 420,000 square metres (4.5 million square feet), equal to the size of the Detroit and Frankfurt auto shows combined. Staff from Global Affairs Canada joined Volpe in Shanghai. The government agency didn’t respond to calls and emails from Automotive News Canada. “You can’t tell whether you’re in Shanghai, Detroit or Frankfurt. These products have arrived, they are world class,” he said. Volpe said research and development investments will follow soon after sales start and then “real Chinese production in North America” will happen next. “We know that Chinese automakers are ready for North American market entry and we know with market entry comes planning for how you supply those customers,” Volpe said. Ontario is the second largest IT cluster in North America, behind only Silicon Valley. Ford and General Motors have both announced huge investments in software development and R&D in Ontario in the last year. Chinese automakers are specifically looking for in-car technology, driveline technology and connectivity, Volpe said.